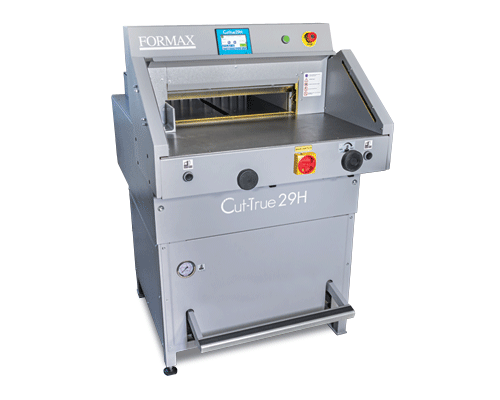 The Formax Cut-True 29H Hydraulic Guillotine Paper Cutter offers precision cutting for paper stacks up to 20.5” wide. User-friendly, intuitive features include a touchscreen control panel, automatically-adjusting back gauge and the capacity to program up to 100 jobs/100 cuts. An infrared light beam safety curtain provides safety and convenience as it shuts down operation if the light plane is interrupted. Operation is simple: utilize the touchscreen to program and select job settings, then load a stack of paper, up to 3.15” high. Set the back gauge using the touchscreen, then use the foot pedal pre-clamp to check the paper position. The bright LED Cutting Line allows operators to see exactly where the blade will cut and make fine adjustments. 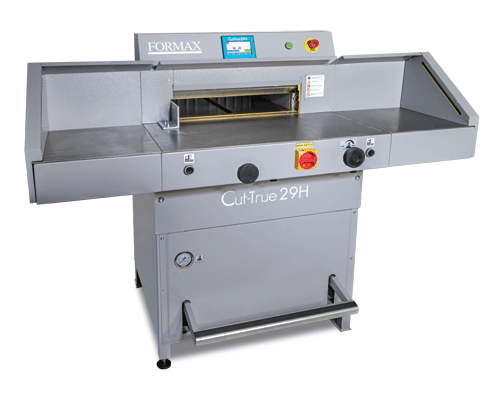 Electronically-controlled two-hand operation engages the hardened steel blade for crisp, accurate cuts, every time. Cutting accuracy is 0.1mm on paper stacks up to 80mm. 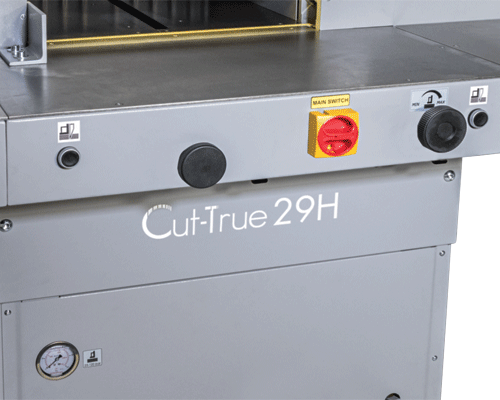 The Cut-True 29H also features a special anti-friction surface with optional wide side tables, making it easier for operators to maneuver large paper stock. The hydraulic clamp pressure is adjustable to give the best clamp possible for different paper weights and stack heights. A false clamp is included to minimize the risk of marking sensitive paper stock or perfect bound books. In addition, the clamp can be removed to decrease the minimum cut length, and stored within the machine. The Cut-True 29H also features an internal light to illuminate the cutting area. Standard safety features include a lock with key, blade lock, external blade depth adjustment, automatic blade return from any position, easy-to-use blade change safety tool, and a wooden paper push for safe alignment. 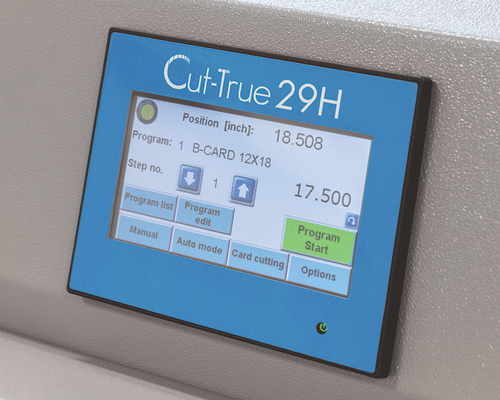 The Cut-True 29H is ideal for transforming large sheets into brochures, invitations and more, with crisp, accurate cuts, and is a welcome addition to print shops and in-plant finishing operations.